There are so many aspects of model railroading to be enjoyed that it truly deserves the title of “The World’s Greatest Hobby”. One of those aspects that I have found very rewarding is custom painting and detailing my engines and rolling stock. I am showcasing my efforts on this website. If you have any questions or comments please contact me. I was introduced to N scale trains by my father over 35 years ago. I discovered the Ontario Northland Railway in a book written by author and O.N.R. historian Frank Vollhardt. This set the wheels in motion for me. I had found a prototype railroad to model in N scale, which required research, road trips, photos (lots of photos), meeting interesting people and joining the O.N.R. historical group. My goal when I started modeling the O.N.R. was to create a model of every type of diesel engine from their first one in 1946 to the present, in every paint scheme. I have accomplished that goal and have continued on with various passenger cars, vans, M.O.W. and auxiliary equipment, and hope to try my hand at a few of the steam engines in the future. 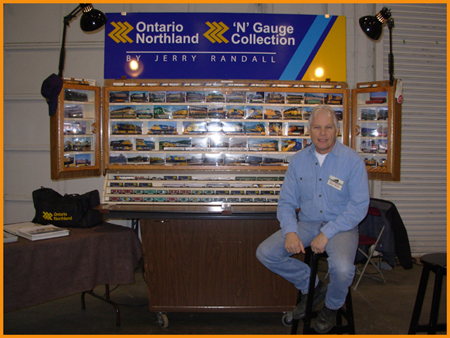 It would appear that there is no shortage of Ontario Northland equipment for me to model. I want to thank Mike Berry for his web design and photography work and hope you enjoy the models. Display set up at the Toronto Christmas Train Show 2008.